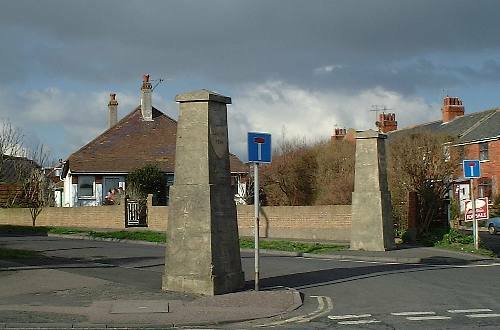 The Lancing park pillars are thought to have been the entrance to a property owned by a music hall actor by one local resident. They are subject to an ongoing investigation by Martin Swain, a resident in the close who has some theories of his own. If you can add anything to clear the mystery please contact me . UPDATE: In the September 2005 Issue of ADUR OUTLOOK the Pillars are featured. The ongoing problem is regarding who is responsible for the maintenance of the structures. The Parish Council have agreed to provide some funding on the condition that the District Council also contribute for the necessary repairs. Negotiations are said to be ongoing. The Lloyd family had become owners of Lancing Manor in North Lancing and its surrounding lands in 1770. The reason for the lack of market gardening in this area was due to the close proximity of the sea. The area was originally below sea level until the 12th Centaury. When the sea finally recede it left a behind a very wind swept, salty marshland which was totally unsuitable for market garden crops because of the high salt content in the ground, despite being gradually drained over the following centuries. The only purpose the Lancing Park area could be put too was for all aspects of horse rearing, training, dealing and recreation. Even an Inn was built, called “The Horseshoes” in the south-east corner of the area for the benefit of visitors to South Lancing. This building still exists today as a Public House called “The Three Horseshoes”. Also in 1845 a famous horse was reared in this area. Although the real colour and name of the horse are uncertain this animal became immortalized in a story book by Anna Sewell called “Black Beauty”. Then at the start of the 20th Century the area was subjected to great changes. The London, Brighton and South Coast Railway company was suffering from a chronic shortage of work space in its works on the side of a hill near Brighton station. So after much searching and negotiation the railway company purchased 137 Acres of the then called Carr-Lloyd Estate in South Lancing, including the Lancing Park area, initially for a railway wagon repair works, but by 1912 the works has been expanded to a carriage and wagon building works. However, only 66 Acres of the land was actually used as a railway works. In 1923 The L.B. & S.C. Railway was absorbed into the new Southern Railway grouping and by 1928 it was realised that the unused railway land would never be needed by the new S.R. so the remaining 77 Acres of land was offered for sale. The portion of the surplus land that was between the works and the sea front coast road (now the A259), attracted the attention of a Mr. Parker Joseph Reynolds who was better known as the comic variety actor Charles Austin. Charles Austin was famous for his comic micky takes of everything and anything to do with the establishment. His most famous sketch was his portrayal of a half witted policeman called P.C. Parker. He would most certainly be considered very politically and socially incorrect now! Charlie or Chas as he was more often called by his fellow entertainers and friends purchased this area, approximately 10 Acres, initially to build a permanent sea-side home for himself and his wife Ruby. The purchase of such a large parcel of land was quite easy for him because he was a very wealthy man earning around £300 a month for his performances. When you compare this with £300 for a new brick built bungalow in the Lancing area during this period, it gives you a good idea of how wealthy he was. Though I suspect that if he hadn’t lost around £50 000 on the Gee-Gees at about this time, including an investment in a rather slow race horse called “Parker” which was quoted as “loitering with intent to finish a race” in the 1927 Derby, he may have purchased the entire 71 Acres. Charlie decided after purchasing the land to build his new home in the extreme western end of his estate, on the corner of the Lower Brighton Road and Western Road. The new house was appropriately called “Charleigh” and it became his permanent home until his death in January 1944. About 6 Acres at the eastern end of his estate he decided to devote to a holiday home project. It seems he was inspired by the great holiday/retirement home development that had been going on since 1914 at Peacehaven to the East of Brighton. 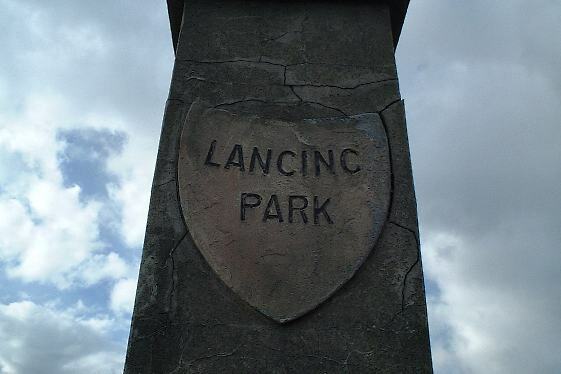 He called his development “Lancing Park” probably because he wanted to continue the idea of a recreational place with both the locals, visitors and of course purchasers. Being a comic mimic to the core, and probably aided and abetted by his entertainment friends like Bud Flanagan, Chesney Allen and “Monsewer” Eddie Gray, members of The Crazy Gang, who either visited him or lived nearby, he erected two pillars at the eastern entrance to his estate, because not only did Peacehaven have ornamental pillars on it’s boundary, but nearby Brighton in 1928 was celebrating it’s very enlarged “Borough” status by erecting two stone gate pillars where it’s new Northern boundary crosses the A23 between Patcham and Pyecombe. Both the Peacehaven and the Brighton pillars are still standing. The Brighton pillars are still referred to today as “The Pylons”. Charles Austin advertised his “Lancing Park” project as building plots “built to order”. In1929 only nine plots were sold, but by 1936 this had grown to 37 plots, not far off the final figure of 47, all of which still exist in some form or other. 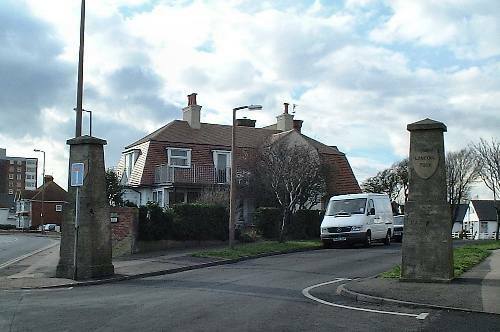 He later sold a further two Acres at the rear of his house for building plots, but as this area was not connected to Lancing Park, he had a new access road built from the main coast road. As he was brought up, did most of his performances and acquired his fame in London, he named this new road “West End Way”. Perhaps Chas Austin’s biggest claim to fame is that he was elected “King Rat” of the Grand Order of Water Rats no fewer than six times (1912,1913,1918,1927,1928 and 1932). A record that still stands today with the G.O.W.R.. The Grand Order of Water Rats is a very exclusive fraternity of show-business performers who meet regularly in the spirit of comradeship and raise money for deserving causes. Chas or Charlie Austin was so well known in South Lancing for this achievement that the locals referred to him as “Ratty”. After Charlie’s death, the house “Charleigh” became a Guesthouse for many years until its demolition in the early 1970’s to make way for a block of flats. I believe all the above information to be correct and I am constantly re-checking information. However if you know anything different, or additional, about the above please do not hesitate to inform me. Copyright Martin Swain, January 2006.